This photo was taken at Roan Mountain on a recent frosty, snowy morning. 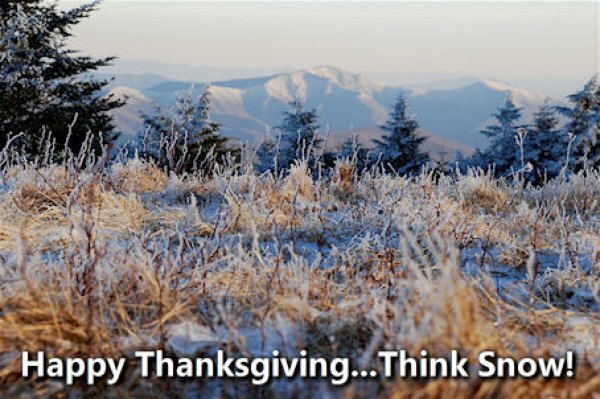 Happy Thanksgiving from the staff of HighCountryWeather.com and SkiSoutheast.com. THINK COLD and SNOW! We know fellow snow lovers are ready for some skiing and snowboarding. The forecast is beginning to look much more favorable! Previous Post Matt, Tripp, Jeff, Forrest and Cody show us what we do around the mountains when we’re waiting for ski season to begin! Next Post Appalachian Ski Mountain is making Snow!